I can’t remember a game where the Bears ran the ball like they did yesterday. 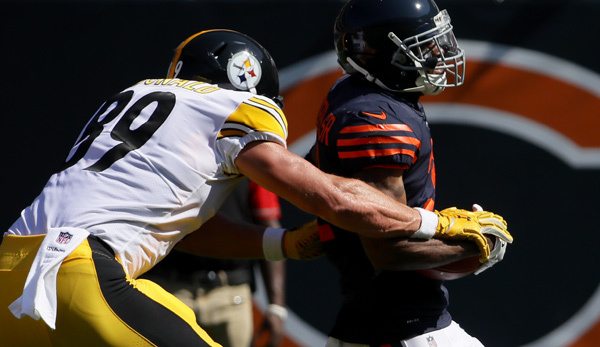 The Steelers knew the run was coming and the Bears didn’t care. Right down their throat over and over, including an overtime win without a pass thrown. That’s historic stuff. 6 yards a carry for Howard. 6.5 yards a carry for Cohen. And if this ends up being a memorable Bears season, we should all remember Jordan Howard leaving everything on the field yesterday. With his shoulder deteriorating by the second, Howard refused to be sidelines. It was movie plot stuff. Mike Glennon is a terrible football player. What’s most frustrating is that he occasionally shows he’s capable of throwing the ball down the field. He just refuses, unabashedly, to do so. Take that back. What’s most frustrating is his complete inability to process what’s happening on the football field. Shame about the Grasu injury. He was exploding off the ball before he got hurt. But an injury to the right hand is a brutal one for a center. Prince Amukamara and Kyle Fuller both making plays was nice to see. The Bears looked like they were completely unable to cover the shallow cross from Pittsburgh and then Pittsburgh stopped going to it. Two or three times in the fourth quarterback Roethlisberger had the route wide open and chose to throw bombs over the top. I still don’t think Tarik Cohen stepped out of bounds. I still don’t think Marcus Cooper committed a hold in the end zone. I still don’t think there’s any level of poor play that would lead to John Fox benching Mike Glennon. Unsung play of the game? Bobby Massie jumping on the Tarik Cohen fumble in the fourth quarter. Still can’t rationalize how Fox and Fangio are using Leonard Floyd in this defense. I get that the kid is versatile. But they are getting so little pass rush off the edge and their best edge rusher is out there covering wide receivers? I don’t know what the answer is but the answer can’t be what they’re doing. Net positive for Pat O’Donnell, who is showing way more pop in the punt game. I just don’t see how anybody is going to run the ball successfully on the Bears. Especially at Soldier Field. Again. Overtime. Four plays. Four carries. 1 yard. 36 yards. 18 yards. 19 yards. Touchdown. That is big boy football. But the Bears now have an opportunity to get through their tough first four at 2-2. And they have a chance for a season.